We love beans. Samantha gets a sparkle in her eye and an excited tone in her voice when she talks about the versatility and health benefits of lentils. Perhaps you don’t love beans the way we do, but we hope this easy recipe helps you think about using beans in dishes other than chili and dip. Preheat oven to 400 degrees. Take cut up chicken pieces – legs, breasts, thighs, all of the above – and put them in a lightly oiled baking dish, skin side up. Rub skin with a bit of olive oil and then sprinkle with salt, pepper and paprika. Open a can of chickpeas (garbanzo beans), drain, rinse and place in a medium bowl. Slice an onion, cube a few small red and/or white potatoes and add them to the bowl. Season contents of bowl with salt and paprika and then add to the pan of chicken. Roast for about 40 minutes. Check to see if the juices are running clear and do so in 5- or 10-minute increments until done. Easy to prepare, and full of nutrition – what more can you ask for? 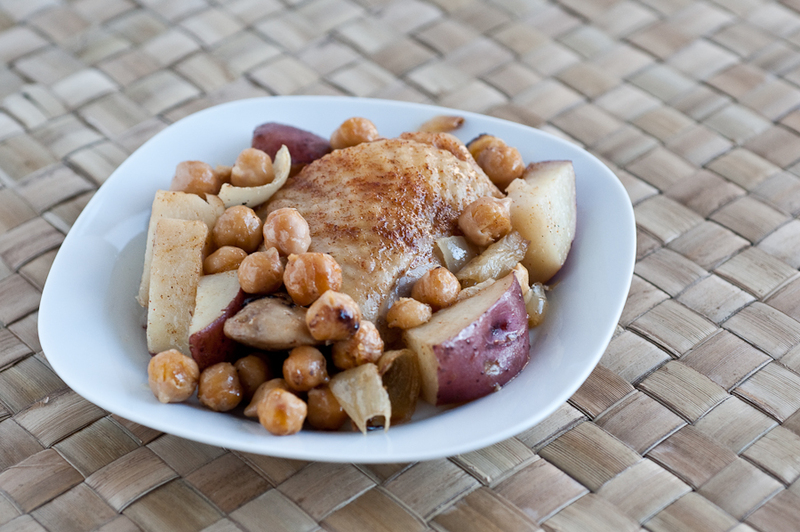 This dish is a super combo of filling protein (from the chicken and the beans), fiber (beans), and Vitamin C (potatoes). For a vegetarian twist, roast other types of vegetables in place of the chicken…sweet potatoes, cauliflower, squash, broccoli, or others. For more chickpea yumminess, check out this chickpea curry recipe – a delicious vegetarian dish! Looking to cut down on your lunch expenses? Dishes such as this make great (healthy) leftovers! How Stacey Got the Shot: ISO 400, 60mm focal length, f/5.6, 1/80th second exposure. I am really digging this new blog layout!